Paella becomes the new wedding fashion. Paella is fast becoming all the fashion when it comes to the wedding breakfast. When Your Paella set up our company, most of the bookings for weddings were for us to come along and cook our delicious Paella’s as the evening meal for all the wedding party and the extra evening guests. 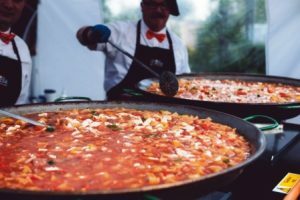 Although that is still a large part of our business, the trend for wedding catering services seems to be going towards Paella as the main sit-down meal. We are receiving substantially more enquires for Your Paella to provide a full menu from canapés to tapas selections, all the way through to the Paella and desserts than ever before. Of course budgets vary according to each weddings requirements, but on a like for like basis, booking Your Paella as the main wedding caterer can save a great deal of money while providing a first class product with a first class service. So how can you save money when your planning your wedding day meal? Rather than let us hire all of the necessary china and cutlery, you could do this yourself. Get a local hire company to provide you with all the plates, bowls etc. This way you will get the style you want and save a good amount of money by not paying the caterer to do this for you. Another way you could save money is by hiring your own waiting staff. 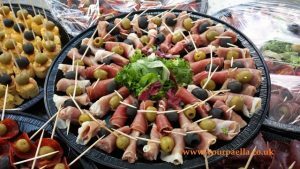 Again this can save you a lot of money by taking this out of the hands of the caterer and doing it yourself. You can check out Your Paella here www.yourpaella.co.uk and they will be happy to supply you with a no obligation free quote. https://www.yourpaella.co.uk/wp-content/uploads/2014/07/P1070986.jpg 1352 1600 Gary Evans https://www.yourpaella.co.uk/wp-content/uploads/2019/01/logotrans1-300x106-300x106.png Gary Evans2014-02-11 10:39:002017-06-01 14:50:56Paella becomes the new wedding fashion.